I wanted to write a more in-depth post about RetroPie the Retro Gaming Appliance OS for Raspberry Pis, either technically or more positively, but unfortunately I don't have much positive to write. What I hoped for was a nice appliance that I could use to play old games from the comfort of my sofa. Unfortunately, nine times out of ten, I had a malfunctioning Linux machine and the time I'd set aside for jumping on goombas was being spent trying to figure out why bluetooth wasn't working. I have enough opportunities for that already, both at work and at home. I feel a little bad complaining about an open source, volunteer project: in its defence I can say that it is iterating fast and the two versions I tried in a relatively short time span were rapidly different. So hopefully a lot of my woes will eventually be fixed. I've also read a lot of other people get on with it just fine. Instead, I decided the Nintendo Classic NES Mini was the plug-and-play appliance for me. Alas, it became the "must have" Christmas toy for 2016 and impossible to obtain for the recommended retail price. I did succeed in finding one in stock at Toys R Us online at one point, only to have the checkout process break and my order not go through. Checking Stock Informer afterwards, that particular window of opportunity was only 5 minutes wide. So no NES classic for me! My adventures in RetroPie weren't entirely fruitless, thankfully: I discovered two really nice pieces of hardware. The first is Lenovo's ThinkPad Compact Bluetooth Keyboard with TrackPoint, a very compact but pleasant to use Bluetooth keyboard including a trackpoint. 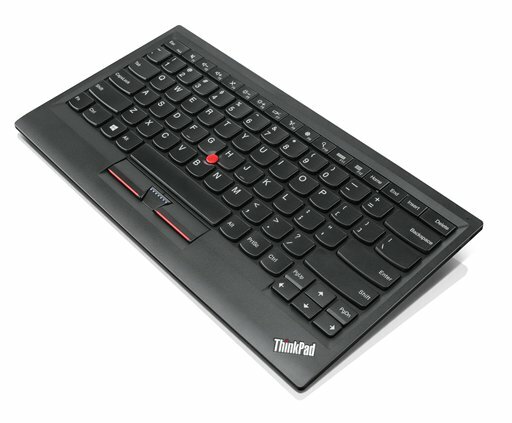 I miss the trackpoint from my days as a Thinkpad laptop user. Having a keyboard and mouse combo in such a small package is excellent. My only two complaints would be the price (I was lucky to get one cheaper on eBay) and the fact it's bluetooth only: there's a micro-USB port for charging, but it would be nice if it could be used as a USB keyboard too. There's a separate, cheaper USB model. The second neat device is a clone of the SNES gamepad by HK company 8bitdo called the SFC30. This looks and feels very much like the classic Nintendo SNES controller, albeit slightly thicker from front to back. It can be used in a whole range of different modes, including attached USB; Bluetooth pretending to be a keyboard; Bluetooth pretending to be a controller; and a bunch of other special modes designed to work with iOS or Android devices in various configurations. The manufacturer seem to be actively working on firmware updates to further enhance the controller. The firmware is presently closed source, but it would not be impossible to write an open source firmware for it (some people have figured out the basis for the official firmware). I like the SFC30 enough that I spent some time trying to get it working for various versions of Doom. There are just enough buttons to control a 2.5D game like Doom, whereas something like Quake or a more modern shooter would not work so well. I added support for several 8bitdo controllers directly into Chocolate Doom (available from 2.3.0 onwards) and into SDL2, a popular library for game development, which I think is used by Steam, so Steam games may all gain SFC30 support in the future too. While the keyboard is still wider than my normal laptop keyboard (IBM X40 at home, X61 at work), at least it doesn’t have those Apple-style insular keys where you rough up your fingertips on the key corners. The extra area to rest the hand on is nice but not necessary; that area has a so thin bottom that you can literally use the desk. And, most importantly, it has no touchpad! PS I'm impressed your x40 is still in use. I blew a capacitor in the charging circuit on mine two or so years ago and threw it away; a decision I still regret. It was my first laptop and I absolutely loved it. If I still had it (and fixed the capacitor) I'd probably use that as a retro games thing instead of a retropie (especially since the thing is desk-bound due to the wireless issues now). Maybe I'll surf for an X61 or similar on eBay sometime. I have a toshiba portégé r600 somewhere (on loan) which has a nicer screen than the X40/X60 generation and a good keyboard but no trackpoint and lacks the charm of the Thinkpads.